Media Math: "12%" apparently equals "One in Five"
1973: The Seeds of Stagflation? Extremely Bad News for I-Bonds! How Do You Get to Stagflation? Why Is Bush So Popular? Poll: What Should We Invest In? Poll Results: How Should We Position Ourselves? I have to start with an apology. This is hardly the Christmas Eve headline I was looking to find. To be quite honest it seems a bit harsh. However, it cracks me up just the same. It has a certain Clint Eastwood feel about it, don't you think? "I am an old school guy," Ake added. "Ten-year notes are supposed to trade off inflation. The Fed is telling you it's rising and the European Central Bank is telling you ... and China is worried about it." I've yet to be burned siding with the old school guys. Until recently, only a small group of contrarians dared to warn about the danger of "stagflation," referring to the feeble economic growth accompanied by surging inflation that marked the oil shocks of the 1970s and 1980s, for fear of sounding alarmist. Ringin' the frickin' alarm bell since 2004. That's what I want on my tombstone! If I am wrong (and I very well could be) it will at least give the next generation something to laugh about. Oh how I hope I am wrong! "People are betting on inflation coming off because of a weaker economy," Ake said. "But you have a bunch of young punks who were not alive in the 1970s ... people have lived without it for so long that they have forgotten how insidious it is." I was six years old in 1970. I remember that era all too well. Okay, maybe I don't, lol. I can say that I can read history though. As a saver, commodity driven economies scare the heck out of me. Bullish investors of today seem to think it is all perfectly normal though. Go figure. The cost of Thanksgiving dinner was 31% higher this year than it was the year when he said it ($32.37 in 2000, $42.26 in 2007). It was up a whopping 11% in the last year ($38.10 in 2006, $42.26 in 2007). The price of pie is now higher. Mission accomplished. SAN FRANCISCO (MarketWatch) - Target Corp. warned on Monday that December sales at stores open at least one year were running well below its previous forecast and may actually decline, jeopardizing earnings growth at the No. 2 U.S. retailer. The warning, among the earliest assessments of holiday retail traffic, fuels fears that the U.S. consumer is starting to feel the pinch of a slower economy, higher prices and a much tighter credit market. Lester Lave, professor of economics at Carnegie Mellon University's Tepper School of Business, notes that since the oil shock of the early 1980s, America has halved its energy use per unit of gross domestic product. The economy is less dependent on manufacturing, and car, plane and truck engine technology has improved, letting consumers and businesses get farther on less fuel. Efficiency has also been gained in areas such as home heating. 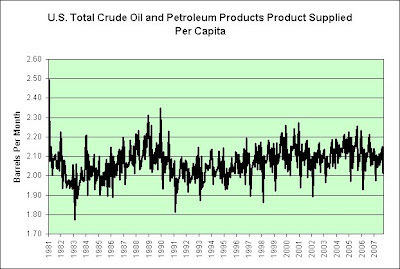 We continue to use as much oil as we ever did per person. 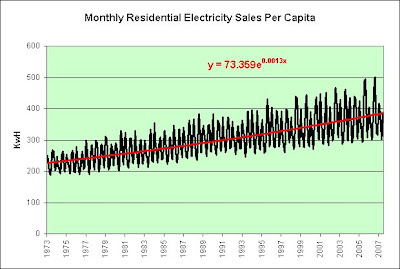 We continue to use more and more electricity per person. It is quite clear in the charts below. In my opinion, to speak as if we have become far less reliant on energy is to miss the big picture. We have shifted from energy intensive goods manufacturing to energy efficient and innovative financial product manufacturing. Perhaps the good professor can explain to me how that will work long-term. I'd really like to know. The good news is that $700 billion in losses due to the credit crisis would require very little oil I suppose. That could be handled extremely efficiently with one stroke of a pen. 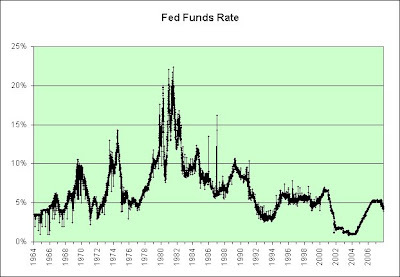 This chart shows the long-term Fed Funds rate. I started in 1964 because that was the last year our quarter had 90% silver in it and was also the year I was born. Perhaps I'm just being overly sentimental. My eye continues to be drawn to the "walking on eggshells" Fed of this new century. It really started spoooking me in 2004. It continues to spook me. It has a certain look of desperation about it, in my opinion. 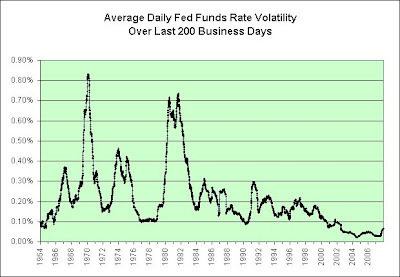 Let's look at the volatility in the chart over the period. There's a lot of different ways to show it. I have chosen (unlike times in the past) to simply chart the absolute value of the difference in the rate from one business day to the next. It has a certain frozen in the headlights look to it. As long as nobody moves quickly, nobody can fall quickly? Once again that's just my opinion though. 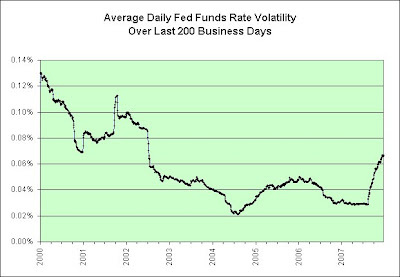 This chart shows the average volatility over the previous 200 business days. As can be seen, there was an unprecedented calm. Ever get the feeling we're in the eye of a hurricane? I sometimes do. Here's a closer look. The official start to the credit crunch volatility season appears to be August 10, 2007. On August 9th the rate was 5.41%. On August 10th the rate dropped to 4.68%. Something broke. However, if one looks back in time (see the second chart) that 0.73% change is nothing in the grand scheme of things. Perhaps we're simply getting warmed up for the main event. You know, like AAA rated securities. The default rate on these loans has been so high that all three of the lowest quality securities are totally worthless, four of the seven mid-level securities are worthless and one other is deteriorating rapidly. The ratings on the top-level securities have been reduced from AAA to BBB and as a result their value has declined markedly. To date, the losses to Goldman Sachs customers are probably in excess of $300 million. But the real bombshell in Sloan’s story was not the shockingly poor quality of the products that were sold or the massive losses that were absorbed by hapless buyers. The real surprise is that Goldman Sachs not only absorbed none of the losses but in fact profited handsomely from the demise of the securities that they were telling clients to invest in. How? Because another part of Goldman Sachs was heavily shorting these securities in their own portfolio at the same time they were recommending them for the portfolios of other institutions. If we really cared for the customer, we'd send them somewhere better. 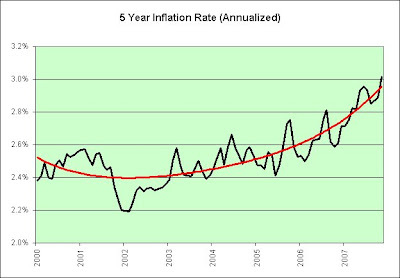 This chart shows the average annual inflation rate over the previous five years. 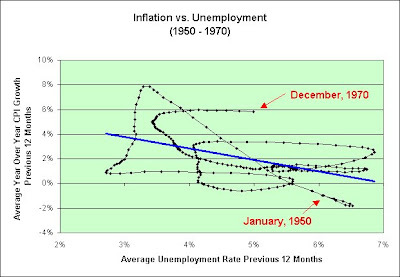 The shaded areas represent recessions. The good news is that inflation isn't picking up as quickly as it did in the 1970s. Here's the bad news. The answer apears to be never. This post inspired by MAB. He wished to see the long-term picture. Thousands of people thronged to the renovated Detroit Institute of Arts when it reopened on Thanksgiving weekend, offering 32 hours of free admission. "If there's a bad economy, the Book Cadillac doesn't know about it." What the heck is a restaurant opeartor? Did spell checking get outsourced overseas? I fall victim to that myself from time to time, but I am not part of the well established media with a reputation to protect. Sloppy, sloppy, sloppy! Raymond James & Co. downgraded the stock to outperform from a strong buy rating, with analyst Brian Elliott saying that Darden's sales at stores open at least one year are no longer strong enough to offset its cost inflation, which seems to have risen significantly in the past three months. Investors who buy the shares at around $33 will be well rewarded over the next one to three years, Elliott predicted in a research note. So tell me Mr. Elliott, what is it about the restaurant business that excited you in this environment and continues to excite you? I'd really like to know how the next three years are going to be so wonderful. If inflation pushes up the price of houses, what will it do to the price of food and oil? If deflation brings down the price of food and oil, what will it do to the price of houses and the employment situation? No thanks. I'm having a hard time seeing the upside. Darden lost 21% today. Had I been a brave man, I would have shorted the heck out of your "strong buy" yesterday (when I shared my thoughts that we've got too many restaurants per capita based on where I think this economy is headed). This brings me to the idea of shorting stocks in general. Even if we are right we could be wrong. If a company gradually slides into the abyss we would gradually make money, right? What if that gradual amount doesn't keep up with inflation? There's a timing aspect here that concerns me. In the 1970s the average company stagnated. The best thing to do in hindsight was to simply find something that could keep up with inflation as inflation rose. LONDON (Reuters) - The problem isn't stagflation, scary as the specter of an ugly mix of poor or negative growth and high inflation is for investors. The problem is knowing which of the two to fear and fight. That's EXACTLY why stagflation is here though. There are two things to fear and fight. The Fed will choose, if it must, to walk the line between the two. Will it not? Further, why would we want to choose, as individual investors, which one to fear and fight? Are we going to ignore the other and hope we are right? To me, the safest "bet" IS the one on an "ugly mix of poor or negative growth and high inflation." If we are wrong, at least we are only half wrong. A sustained period of both the fire of inflation and the ice of a credit crunch-induced slowdown is highly unlikely. You mean like the 1970s? When we kept toggling back and forth between serious inflations and serious recessions? Dare I remind you what eventually pulled us out of it? In my opinion, we embraced debt. How are we going to embrace even more debt this time around? What if we stay stuck in the 1970s? In the 1970s the rising price of oil was political. What if it is geological this time? But while the combination of inflation and poor growth is daunting, currency strategist Stephen Jen of Morgan Stanley points out that the inflation data reflects the immediate past, rather than the future. I refer Stephen Jen of Morgan Stanley (whose company was not well positioned for this environment if its stock price is any indicator, down 45% from its 52-week high) to the 5-year inflation chart as seen here. The CPI has risen at an average rate of 3% per year for the last five years and the trend has been rising. Perhaps I am wrong to be a stagflationist. It is quite possible. However, I would argue that we've been stagflationary for a long time. The investments that worked best in the 1970s have worked best in this current environment. It didn't just start in the "immediate past" either. Look at the rising price of oil. It preceded the dotcom bust and was quite possibly a factor in popping that bubble. For perhaps as many as 27 million American adults, keeping warm this winter will mean borrowing money and 20 million will use credit cards to be able to afford their heating bills, according to a CreditCards.com poll. Nearly 12 percent of Americans say they will need to borrow money to pay winter heating bills; 9 percent will need to use credit cards to be able to afford their heating bills. I'd like to comment further on the article but I can't seem to get past the media math. I'm apparently proof that shock and awe works. Domino's third quarter earnings didn't deliver, and weren't very filling. First up, farm prices received from November 2006 to November 2007. The average price of a 40 pound block of cheddar cheese _ the standard U.S. Department of Agriculture cheese measurement _ rose nearly 6 cents to $2.04 per pound in the past week, according to a USDA report Friday. That's well ahead of the price of cheese at the start of the year, when the average price was closer to $1.30 per pound. And finally, Domino's delivers. Here's the change in gasoline price from December 18, 2006 to December 17, 2007. Now let's tack on falling inflation adjusted median incomes, a housing bust, a credit crisis, and an increasingly tapped out consumer (due in part to the rising prices shown above and as verified by seemingly poor retail sales during the holidays). Storms just don't get much more ominous than that in my opinion. Of course, the market is attempting to price a lot of this storm into Domino's. Unfortunately, I think the rest of the market is still working under the assumption that the pain is contained. I'm not nearly so confident. Update: I said falling median incomes but meant falling inflation adjusted median incomes. Normally I'll just fix typos silently but that was more of a blunder. Sorry! Battling inflation fuelled mainly by rising food prices, China announced yesterday that it would scrap the 13 per cent tax rebate on exports of grains to discourage overseas sales. Part of the current problem is an outgrowth of prosperity. I think you can pretty much guess what I think of that statement, based on the name of my blog. Thanks go to abby normal for offering this link. It is a must read article. Some future food inflation certainly seems "baked" in. Wheat prices crossing the $10 a bushel threshold won't immediately translate into a spike in retail prices for bread, cereal, cookies and other products, experts say. That due partly because companies like Kellogg Co., General Mills Inc., ConAgra Foods Inc. and Kraft Foods Inc. typically protect themselves from price volatility with long-term supply contracts. But analysts say consumers should expect that higher wheat prices will eventually work their way into the grocery aisle. This is a service for my readers. Don't tell your friends and family. If everyone started to hoard food just because I mentioned it might be a good idea, then the black helicopters might appear over my house and that would be the last you ever saw of me. I also don't want you to do jail time like Martha Stewart just because I tossed you a food hoarding tip. I don't really think this is inside information though. Wheat prices are public information. The video is an April Fool's Day prank the BBC pulled on the public in 1957. Unfortunately, the video quality isn't all that great (and worse, today's spaghetti prank seems to be the real thing). There's sarcasm here in places, but perhaps not nearly as much as you might expect. It was a bad day in the stock market so let's look through some of the ishares treasury funds for a clue what people might be thinking in the inflation vs. deflation debate. TLT was up 0.89% on higher than normal volume. It is a 20-year treasury fund with no inflation protection. The deflationists had guts today. I'll give them that. I welcome their conviction and hope they are right that inflation will remain tame. I did say I was tempted to change my name to Deflationary Mark after Greenspan finally spotted stagflation. I just don't have the courage, nor will I ever more than likely. TIP was up 0.73% on slightly lower than average volume. It is an intermediate term treasury fund with inflation protection. The paper stagflationists had a good day, but not quite as good as the deflationists. That's hardly a surprise, based on the stock market's deflationary activity. IEF was up 0.59% on lower than average volume. It is an intermediate term treasury fund without inflation protection. Since IEF has roughly the same effective duration as TIP, stagflation was the preferred bet in this time frame it seems. That is a bit surprising perhaps, since the deflationists acted with such conviction on TLT. SHY was up 0.29% on lower than average volume. It is a short term treasury fund without inflation protection. So what's the moral of the story? If you are a bull you can simply buy the stock market. If you are a bear you also have to choose between deflation and stagflation (and possibly hyperinflation, but treasuries can't help you there). Those betting on deflation were rewarded today. Those betting on stagflation were rewarded today. 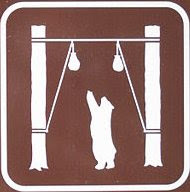 Perhaps just being a bear is good enough in this environment. It also implies that the Fed is riding the deflation/inflation line fairly well. That's about all we could really ask of them. It is my belief that the deflationary forces are not the good kind (housing bubble popping) and the inflationary forces (excess fiat paper) are not the good kind. The middle ground, as I interpolate, is therefore not the good kind either. Two wrongs will never make a right. LONDON (AFP) — Oil prices fell as the market tracked fresh concerns about the US economy, with fears that a slowdown in the United States could dampen demand for crude, traders said Monday. One of the things I try to do a few times during the week is search for "stagflation" in the news using Google. It has been running around 200 news articles or so at any given time. Today there are 1,002 articles. Good grief. We just passed "deflation" and its 641 articles. WASHINGTON (Reuters) - The U.S. economy is showing early signs of stagflation as growth threatens to stall while food and energy prices soar, former U.S. Federal Reserve Chairman Alan Greenspan said on Sunday. Thanks Greenspan. You finally noticed food and energy prices. Congratulations. Have you been staring at the core inflation data all this time? It is nearly enough for me to want to increase my deflationary short-term outlook to something even more deflationary while simultaneously changing my name to Deflationary Mark. Seriously. Greenspan testified that rising commodity prices are not a big inflation threat, saying labor costs, about two-thirds the costs of goods and services, were declining, though not as rapidly. This is one of my favorite topics as you can probably guess. This is a chart showing how we would have done buying the 10-year note and holding until maturity. It ends in November 1997 because notes purchased then would be maturing right now (and we can use the last ten years of inflation data to see how we would have done). I've showed similar charts in the past. This time I have a few more charts to think about. This is how we would have done had we simply gone shopping based on the nominal yield we were offered. 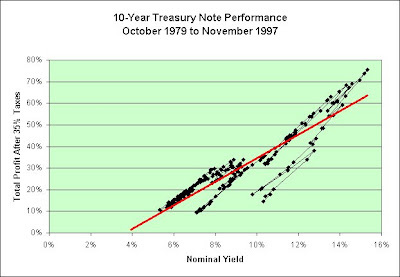 The higher the nominal yield, the better we would have done in general. Note that the current yield on the 10-year treasury note is just a hair over 4%. That does not inspire confidence that it will be yielding a great deal of profits. It could of course, should we experience a severe deflation. I'd just be wary of betting on that outcome personally. Now let's talk about how the above chart is actually two entirely different eras. 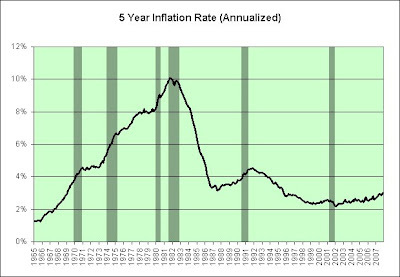 This shows an era when interest rates and inflation started off very low and generally rose over time. 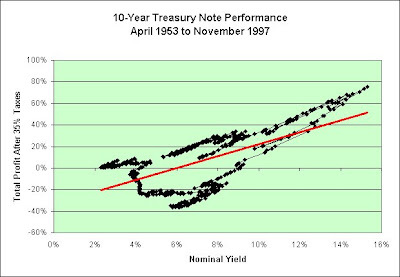 Note that for roughly two decades the 10 year treasury note was a relatively bad investment. 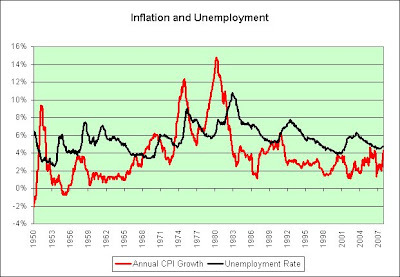 This shows an era when interest rates and inflation started off very high and generally fell over time. 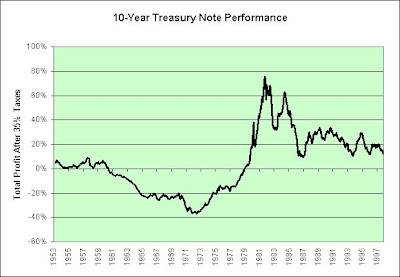 Note that for roughly two decades the 10 year treasury note was a relatively good investment. The 10-year treasury is currently yielding just over 4%. That doesn't look great on either era's chart. 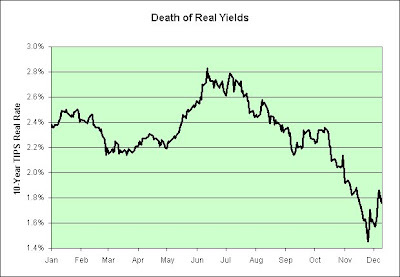 This is one reason why I'm willing to predict the death of real yields. I might be wrong, but I think it is going to be very difficult to actually make money in the future. Let's do some quick math using the treasury market's own data to predict the 10-year treasury note's expected 10 year profits as of 12/14/07. The 10 year note yields 4.24%. The 10 year TIPS yields 1.90% (plus inflation as time goes on). That puts the expected inflation at 2.34% per year. If you earn 4.24% but pay 35% taxes, that's an after tax growth of 2.756%. You will lose 2.34% to inflation though. After 10 years you will have earned 4.1% in total real after tax profits. That's pretty much in line with the extrapolated red trend line in the bottom chart. That's the good era's chart though. If we slide into the bad era's chart, oh oh. We could be looking at some serious losses. This is not investment advice. The deflationists could be right. I'm just suggesting that they've got some serious kahonies to be that sure they are right. I also want to point out how we will probably react if inflation and interest rates rise. We probably won't be thinking in terms of positive real yields. The aftermath of the 1970s ended up providing real yields simply because inflation fell. Inflation is not guaranteed to fall. It might stay uncomfortably high for longer than any of us could possibly imagine. Past performance is no guarantee of future results, right? Further, if inflation does fall that doesn't necessarily mean we will know it in advance. I suspect strongly that low real yield expectations, once established, would therefore remain low. I also want to add that the 10 year TIPS isn't going to perform any better if the market truly understands the next 10 years worth of inflation with its prediction. 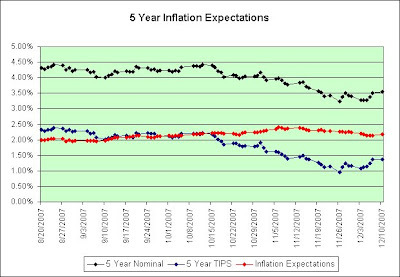 However, if (big if) the market should be wrong and both inflation and interest rates do rise, TIPS would be vastly superior to nominal 10 year notes (as TIPS are tied to the inflation rate). As owners of TIPS we should want to be wrong. We still want low inflation (if only so we pay less taxes). It is kind of like having homeowner's insurance. Just because you have it doesn't mean you pray for your house to burn. Those holding nominal treasuries would outperform us, but we'd be doing okay. We therefore would relish being wrong. We'd love to be wrong on almost everything in fact. It would be so much easier to protect ourselves. Inflation hurts everyone. “Neither China nor the United States can protect our way to further prosperity,” he said. Here are some other things we can't seem to do. We can't seem to do the opposite things either. In "Squanderville," as Warren Buffett called the United States back in 2003, Americans are ready and willing to believe anything…that their homes will always rise in value, that their debt will never catch up with them, and that the American Empire is unshakable. Rising prices are the main factor stoking inflation but we also can't rule out the money supply, lol. This is an update to charts I've done previously. The November data is out. I have also modified the charts slightly by adjusting for the growth in our population (to better see what we are doing individually). Here's the inbound traffic. 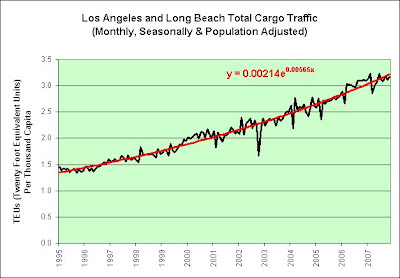 Ugly is about the only word I'd use to describe that change in trend, not that anyone could have really thought the explosive growth was endlessly sustainable. 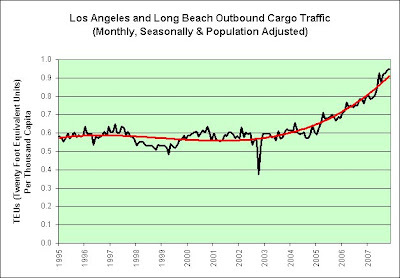 Here's the outbound traffic. Our falling dollar is helping here it seems. 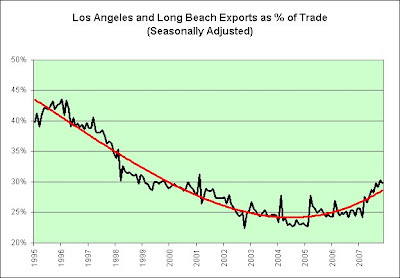 Here's exports as a percent of exports plus imports. This is an attempt to simplify some of the conclusions in my last post. 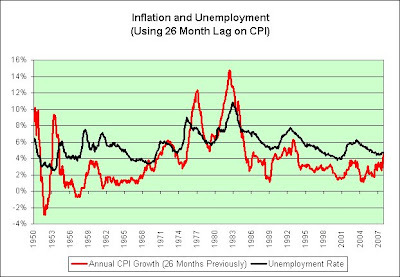 This chart shows the year over year annual CPI charted along with the unemployment rate. I have made no attempts to smooth the data. 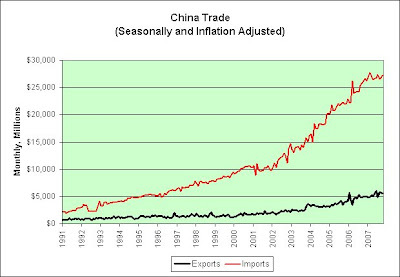 This chart shows the conclusion of the previous analysis. There appears to be a 26 month lag between the two (actually 32 months if one factors in the inherent lag from the year over year calculation in the annual CPI growth). The question we should probably be asking ourselves is what the Fed intends to do about the currently rising inflation rate. It is cutting interest rates at a time when history says it would have been prudent to do the opposite. We all know why they are though. The housing situation is in an awful mess and consumer spending is poor. Perhaps that alone will be enough to tame inflation. Time will tell. In any event, if they are wrong the market will eventually do it for them anyway. While the interest rate on the one month treasury bill has plunged over the last two weeks (from 3.63% to 2.61%), the 30 year treasury bond rate has headed in the opposite direction (from 4.40% to 4.66%). Should those trends continue, it will add just that much more pressure for the already struggling housing market. Well, unless homebuyers only need to borrow money for 30 days that is. This is the chart I posted previously in Inflation vs. Unemployment. It is rather complicated and it would be easiest to simply read (or reread) what I said then. Picosec left me a comment and was curious if I could improve the correlation by imposing a lag. This is a chart showing the results of doing that. I've introduced a 26 month lag (seemed to be the highest correlation). So what does this mean? If inflation is running hot, it seems the Fed sees that inflation and spends the next 26 months trying to stomp it out. In other words, the inflation comes first and then the unemployment. I find that very interesting. Let's not stop there though. 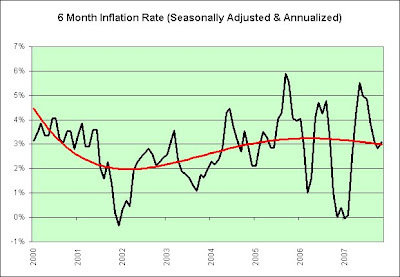 Due to the way I'm calculating the CPI there is already an inherent six month lag. For example, we know the unemployment rate rate right now but we're using a year's worth of data to calculate the CPI (so it is therefore about six months lagging on average). That would put the true lag at 32 months if I am thinking it through correctly. Let's double check the math slightly using some real world data points. Year over year CPI growth peaked at 14.76% in March 1980. Unemployment was 6.3%. Unemployment peaked in November 1982 at 10.8%. That was 32 months later. The math is pretty close. 26 months is what we were shooting for (since it too has the bonus six months lag already inherent in it). Now let's talk about our current situation. The highest recent (since 1991 anyway) year over year growth in CPI happened in September 2005. It was 4.69% and that was 26 months ago. Unemployment is currently lower now than it was then. In my opinion, the Fed is having a hard time (due to the credit crisis) doing what it wants to do. There are plenty of deflationary forces attempting to cause pain right now and there are also plenty of inflationary forces attempting to do the same. I see the combination as painful even if the CPI does behave itself, go figure. 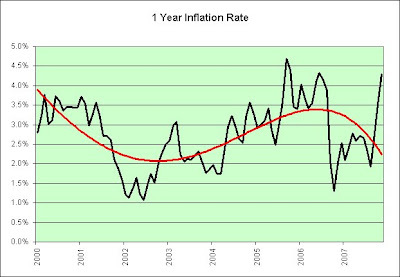 However, inflation is currently running hot on almost every time scale (3 months, 6 months, 1 year, 2 year, and 5 year). It's hard to put a happy face on that, especially 32 months from now if history is any indicator. It will be even worse if inflation continues to climb of course. Here's a chart showing that same 26 month lag applied to an era when we were on the gold standard. There's almost no correlation at all. 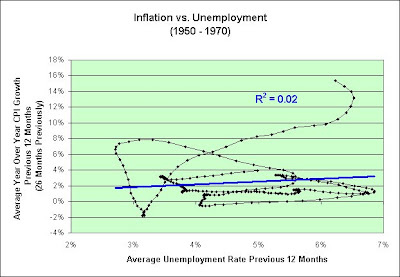 Inflation did its own thing and didn't seem to care what unemployment was doing. Either that, or the Fed simply didn't have nearly enough data on hand to know what to do. That's also possible. 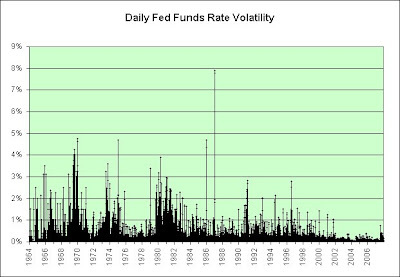 We no doubt have vastly more data at our disposal than the Fed did 50+ years ago. It is amazing to me how much data can be extracted from just two long-term series. The St. Louis Fed provides over 13,000 such data series. Is is also possible that the Fed has more control over "consumer" inflation now that the "consumer" is hooked on debt. Can you imagine what our economy would do right now if interest rates rose to 10%? Somehow sticking a fork in it and calling it done doesn't quite do the situation justice in my opinion. Once again, thank you Picosec for prompting me to go down this path! In my opinion, imposing a lag has been extremely enlightening. I'm once again reminded of that quote I saw somewhere on the Internet. In the beginning of a great inflation everyone benefits and nobody pays. In the end nobody benefits and everyone pays. It looks to me like "payday" generally comes about 32 months later. This is an update to a chart I posted earlier today. It includes the most recent CPI data. 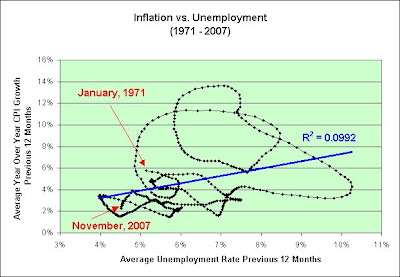 You'll really need to read the previous "Inflation vs. Unemployment" link below to have any idea what this chart is supposed to show. It is probably my most complicated chart to date. I can summarize the results though. The inflation number came out today at 4.3% year over year. We're being dragged kicking and screaming up away from deflation and towards the blue trend line. Meanwhile, unemployment is beginning to creep up too (~4.7%) so we're also being pulled to the right as well. As far as this lagging chart is concerned, both of these two forces are baked-in. This does not mean that future inflation is guaranteed. This is all just looking in the rear view mirror and hoping to make some sense of it. However, it does support Bernanke's deflation isn't going to happen here mindset. We were clearly diving into the deflationary abyss and bounced (at least in my opinion). I figure if the government can strip out food and energy when trying to make sense of the underlying trend, I might just as well too. Here's a graphical view of November's sensational(ized) retail sales data. Get the lipstick out. The pig is in need of service. The shaded area represents our last economic contraction. 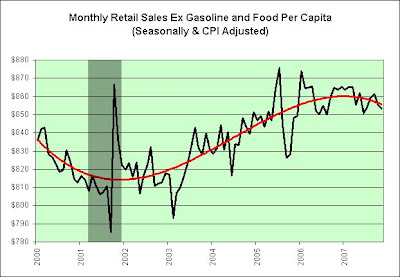 This chart shows retail sales excluding gasoline stations, food and beverage stores, and food service and drinking places (per capita and adjusted for inflation). The trendline is a 4th order polynomial and simply represents what my eyeball seems to see. It continues to look like it is rolling over to me, for what that's worth. Thank goodness I don't invest based on my short-term mood (as seen in the upper left hand corner of my blog). However, the long-term's looking pretty good (if by good you mean you actually enjoy inflation, which I do not). Yet another day passes and I continue to be comfortable with the stagflationary view of things. Here comes the most obscure roller coaster ride charts I've done yet. Please make sure your seat belt is securely fastened. The x axis represents the average unemployment rate over the previous 12 months. The y axis represents the average year over year change in the CPI over the previous 12 months. In other words, it is a moving average of the last 12 months worth of year over year CPI growth figures. I know it is a bit confusing, but I wanted to smooth out the data enough to make sense of it. This is what it looked like when we were on a gold standard. If unemployment picked up in the long-term, you could pretty much expect inflation to turn down in the long-term. Note how the blue linear trend line tilts down. Not shown on the chart is the Great Depression. 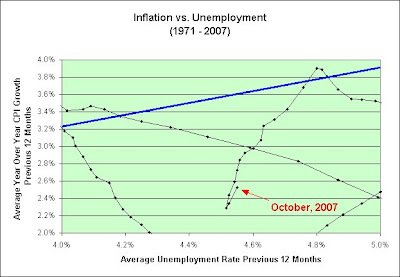 Picture that blue line extended out with very high unemployment. This is what it looks like now that we are not on a gold standard. 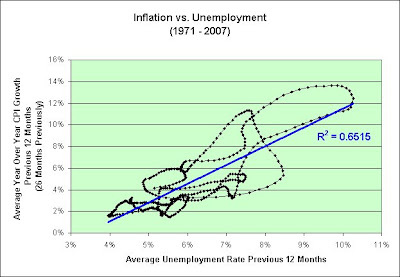 If unemployment picks up in the long-term, it isn't as clear to me that inflation will turn down in the long-term. Note that the blue linear trend line tilts up. The 1970s are shown on this chart. What a wild ride that was! The good news to me when I look at this is that someone was at least trying to tame the beast. Had I been investing in the 1970s I would have been very inclined to panic. Right or wrong, I'm determined not to panic if we relive that era. I'm going to try to ride it out. That could be a very big mistake though. Hopefully inflation will stay somewhat tame and save me from testing my resolve. As far as current inflation goes, we're in a relatively sweet spot (using the rear view mirror). Unemployment is still relatively low. Inflation is still relatively low. There's some pressure due to recent inflation and higher unemployment numbers though. All things being equal, we should therefore start drifting up and to the right a bit from where we currently are. Let me zoom in on the chart and show that to you. One has to wonder if all things are being equal. I have a very uneasy feeling about the housing market. However, I also have a very uneasy feeling about our dollar and oil. Two wrongs are very much trying to make a right it seems. Then again, they've been doing that for as long as I've been bearish (over three years). I also want to remind you that our current point on these charts is not where we currently are. There's a lag imposed by using moving averages to smooth the data. Therefore, the current point on the chart is under pressure to slowly move to where we actually are. In other words, up and to the right is somewhat baked-in. I braved Bellevue Square Mall (one of the Seattle area's largest malls) this Thurdsay evening to do some shopping. My girlfriend and I arrived around 9pm and shopped until 10:30pm. There were signs it was packed earlier in the day based on the "lot full" signs still left in place. Our first stop was Papyrus to pick up some cards. There were a few people in there. Nothing out of the ordinary though. I did not have to stand in line. The next stop was Crabtree & Evelyn to buy something for my mom. I spent probably 20 minutes thinking about what to buy. I was their only paying customer during the period. Someone else came in while we were there but was just looking. Another couple did the same. We stopped for a drink at Orange Julius. There was one person in front of us. We waited about 30 seconds in that line. That's all I really needed to do today, but we decided to walk through the Macy's Home Store. We really could use more sheets and I'm in a hoarding mood these days. For the 15 minutes or so we spent in that section of the store, we were once again the only paying customers. We were drawn to the 60% off sale on flannel sheets. We bought three sets. That's all we bought. I might even go back and buy more before the weekend is over. It isn't like sheets ever go bad. I'm not sure what I expected to see on a Thursday night. I generally try to go when others aren't around. This year it seemed especially empty. Perhaps business was much more intense earlier in the day, but based on what I saw it doesn't exactly look like a stellar shopping season to me. So ends my story. Completely anecdotal and most likely nearly completely useless. Or is it? NEW YORK (CNNMoney.com) -- After getting off to a fast start last month, holiday sales at some of the nation's largest retailers have slowed to an excruciatingly slow pace and mall traffic has dropped dramatically. Christmas Shopping Gloom Spreads Throughout U.K.
London, England (AHN) - Like many Americans, British consumers are not rushing to shopping malls and department stores. The Christmas shopping gloom is over the nation, bugged by worries over expectations of a high inflation rate next year. 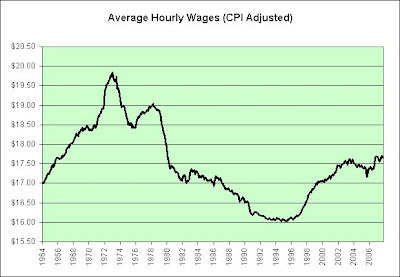 This chart shows the average hourly earnings adjusted for inflation. If rising wages were responsible for the stagflation of the 1970s, then the damage was clearly done before January, 1973. That was when average hourly earnings peaked. 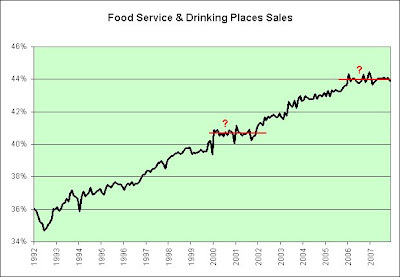 This chart shows the retail sales at food service and drinking places as a percentage of sales made at food service and drinking places AND food and beverage stores. I'll have more charts of retail sales once the CPI is released tomorrow. Another month passes. Here's two more charts. 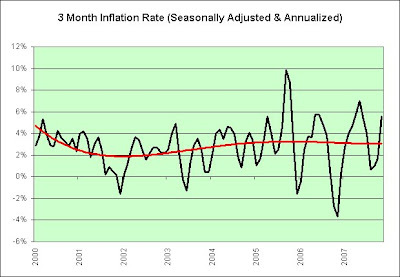 I have adjusted the data for inflation and then seasonally adjusted it (using the tool below). 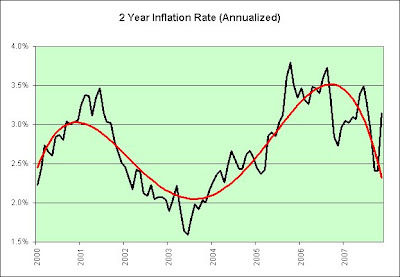 We're simply keeping up with inflation lately, much like we did during the recession of 2001 perhaps. And when I say we are keeping up with inflation, I mean OUR currently relatively low inflation, not China's currently relatively high inflation that's seemingly getting worse by the day. Sorry China! I don't know what the problem is. Why is the growth in this chart vanishing before our very eyes? Can't we just keep printing more money and then ship it over to China endlessly? What's the harm? *sarcasm* They still seem to want it for some reason. Their only gripe is that it is no longer as strong as it once was. Well, d'uh! "(The yuan) is not the key issue. Currently my focus is more on the depreciation of the US dollar and its possible impact and repercussions for the world economy," Chen told reporters on the sidelines of the conference. "I sincerely wish to see a scenario where the US economy is getting stronger and the US dollar is getting stronger." Wouldn't we all. Too bad the monetary printing presses can't print actual prosperity. Illusions of prosperity are "poor" substitutes. Hey, I resemble that remark! Chen, here's a thought. Use our money to buy something from us. Problem solved! Or are you too busy hoarding our currency in case your entire banking system falls apart? You know, the banking system that can't even afford to pay a positive real rate of return during one of the biggest economic booms in all of civilized man. Some conundrum you've got there. And as prices for various commodities on the international market keep on increasing, it makes more difficult to bring down domestic prices. Because of the CPI's continuous rise, the actual interest rate, or the inflation-adjusted interest rate, has been kept negative. It was 2.82 percent under zero in October after several rounds of interest rate hikes. Worse, the China Banking Regulatory Commission, the country's banking watchdog, found in a recent study that a considerable amount of bank loans were involved in fake or deceptive property deals. Want a truly twisted and warped economy? Send real interest rates below zero and watch the hilarity ensue. As seen in our own subprime fiasco, negative real interest rates get people to do the craziest things. Who knows what's been going on in China. Just how many factories were financed using egregiously cheap money, anyway? I don't know. Does anyone? The nation is at risk of industrial overcapacity. One need look no further than our housing capacity to see what cheap money can do. At some point the cheap part goes away though, and everything suddenly seems to turn expensive. Just my opinion of course. 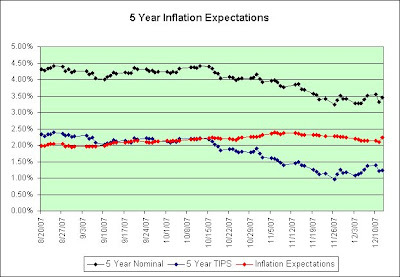 Check out today's bounce in the 5-year inflation expectations trend. The reason it is there (as seen in the chart) is because interest rates bounced higher on the nominal 5-year treasury bond today but did not bounce similarly high on the 5-year TIPS. "Today's data imply substantial upside inflation risk over the near-term," wrote Mike Englund, chief economist for Action Economics. This chart shows the tangible assets, financial assets, and liabilities adjusted for inflation per person in the United States as seen in B.100 Balance Sheet of Households and Nonprofit Organizations within the Flow of Funds Accounts reports (through the 3rd quarter of 2007). 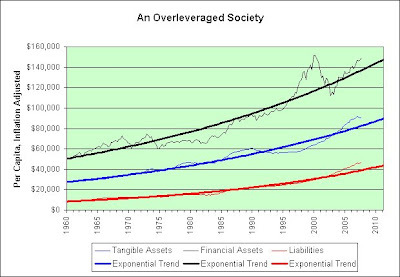 This chart shows the amount that each asset/liability is above/below the exponential trend line. 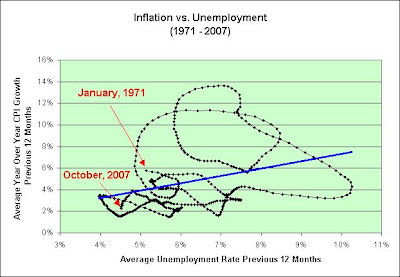 As a stagflationist, I was curious if anything during the stagflationary 1970s resembled what we are seeing now. I draw your attention to the year 1973. 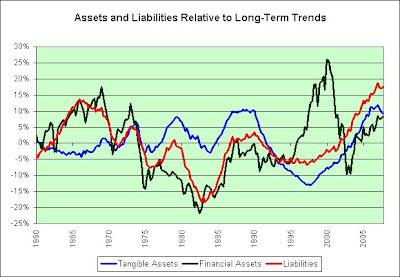 Tangible assets, financial assets, and liabilities were all well above the trend line, just like they are now. Now would probably be a bad time to mention the price of oil, wouldn't it? To make matters worse, tangible assets are twice as far removed from the trend line as they were then and liabilities are about three times as far removed. Financial assets aren't looking all that well either. Further, if anyone thinks tangible assets (i.e., real estate prices) have a hope in you know what of not continuing down the path they are currently on speak now or forever hold your peace. I refer you to the cover of Time Magazine for December 9, 1974. 1974 was one of the worst recessions in American history. Now is probably not the best time in American history to go out and embrace risk. Just a hunch. Note that this is yesterday's article. The warning was issued before today's stock market slide. As such, I think he deserves an honorable mention. The problem is simple: people bought houses during a boom, at bubble prices that they couldn't actually afford. The money that was lent has already been dissipated to the sellers – the owners of the houses don't have it, and neither do the lenders. The excess money that homeowners can't actually afford to pay back will have to be written off institution by institution, lender by lender. Major loan losses are inevitable. To believe they are something less than inevitable is to stay at the party even as flames climb up the building, in hopes that water is on the way. The U.S. financial system is going to have a bad time with this – there will be large losses and major adjustments. Eventually we will work through it, but it is delusional to look for a bottom when the real losses haven't even started to emerge. It turns out that inflation-indexed TIPS are highly correlated with the stock market and the economy. Declining investment returns, sinking stocks, and falling economic growth are all captured in declining real TIPS yields. Ten-year TIPS, for example, have dropped to roughly 3% today from nearly 4.5% eighteen months ago. As of today, we're looking at a mere 1.76%. Better hope the stock market and economy don't "highly correlate" soon. Consumer prices were 6.9 percent higher in China in November than a year earlier — the biggest increase in Chinese prices in almost 11 years. The big contributors were food prices, which vaulted 18.2 percent, and fuel prices, which climbed 5.5 percent as the Chinese government raised regulated retail prices for gasoline and diesel, although these prices remain slightly below world levels at $2.65 a gallon. Is this really all that surprising? Let's go back in time a bit. "Let's make it simple: we can't put our money in the bank if interest rates are negative. We must at least give deposit holders some interest," Zhou said in a live Web cast on the Chinese government portal www.gov.cn. Make the money so toxic that you have to buy something with it before it loses its value. That's a fantastic way to run an economy. "There's no need to worry about big price increases. The scenario is unlikely to play out," said Zhou. Yeah, that not worrying theory is working out just great so far. Each line in the chart represents a given tax bracket. 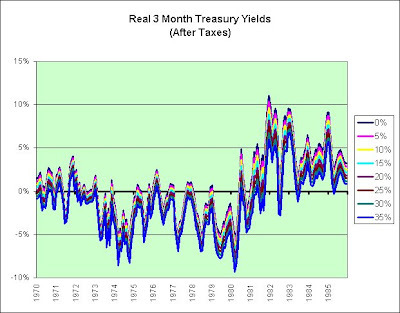 For example, the blue 35% line shows the inflation adjusted real treasury bill yield for those in a 35% tax bracket. This is a continuation of a previous post showing the added damage high taxes can cause. Although yields were negative in the 1970s when adjusted for inflation, the government still taxed the "profits." Since interest rates were high in the 1970s, taxes were also high. When inflation is 1% and you earn 1%, it isn't a big deal. When inflation is 10% and you earn 10%, it starts becoming a big deal. When inflation is 10%, you only earn 7%, and you are taxed on that 7%, it becomes a very, very big deal. This is the sort of thing that just gradually sneaks up on you too. When three month treasury bills are underwater there is always hope that things will change for the better in just three more months. It isn't like you are locked in. Only what if things don't change for the better? What if we keep stagnating? There was a serious recession in 1974-1975. Real yields were not exactly positive. The deflationists expecting Great Depression level real yields at that time must have been sorely disappointed. How much risk is there? All I can say is that the three month treasury bill is currently yielding 2.91% as seen here. I cannot predict what the CPI will do over the next three months so I can't actually say that the real yield is negative. I can say that it is unlikely that the yield is seriously positive. The CPI is up ~3.5% over the past year and oil is still hanging in there. Further, the consensus estimate for the rise in the CPI from October to November is 0.6%, as seen here. That isn't exactly tame. I'm hoping that is true. Although I love to heckle the Fed in general, our Bernanke Fed seems to be doing okay (all things considered) in the aftermath of the Greenspan Fed (who helped "secure" us a stock market bubble in 2000 but more importantly the housing bubble we're experiencing now). ``The market, by keeping the same inflation expectations while lowering growth expectations, is implying there are inflationary pressures,'' Pond said. He held to that view even as the forward rate fell last week. I agree. The market is not all-knowing but I do draw some comfort from the fact that future inflation expectations are somewhat tame. My expectations are not all that tame into the distant future, but it is always possible I am wrong. For what it is worth, I'd vastly prefer to be wrong. Well, we certainly don't want them to forget about it. Here's another look. 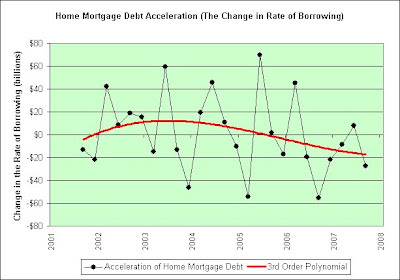 Since I think the game changed on August 20, 2007 ("credit crunch" day), that's when the chart starts. So far, so good. 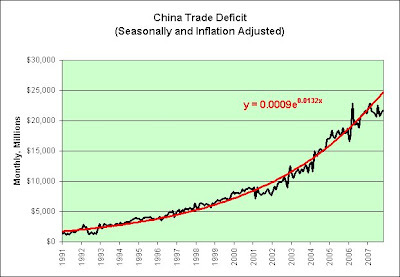 Stephen Green, Shanghai-based economist for Standard Chartered Bank, points out the government is virtually unable to tighten the money supply to cool demand. "They are really stuck up the inflationary river without a monetary paddle," he said. That's because if China increases its interest rates while the U.S. Federal Reserve leaves its rates unchanged or even lowers them, more capital will flow to China, thereby increasing the money supply instead of tightening it. Of course, the best way to get unstuck is to eventually experience a Great Depression based on excess manufacturing production capacity built upon a sea of unsustainable growth. Just a theory. 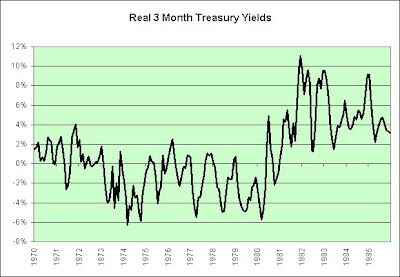 This chart shows the real yields on three month treasury bills in the 1970s. Each point on the chart represents the gain from the purchase three months prior and was adjusted for the inflation during those three months. The net was then annualized to show the the real annual return (before taxes). 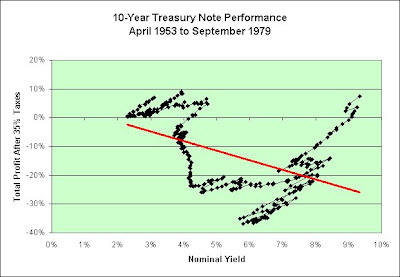 Yields on treasury bills were often high during the 1970s but inflation was generally even higher. Therefore, real inflation adjusted yields were actually negative. To add insult to injury, this does not factor in the the taxes paid on the treasury bill interest generated. As interest rates rose, so did the taxes on that interest. 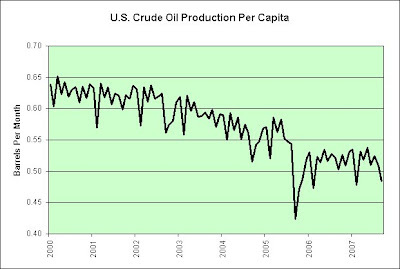 The high price of oil is not having a noticeable effect on U.S. crude oil production. We continue our descent into the abyss. It is having an effect on imports though. The shaded area shows our last recession. 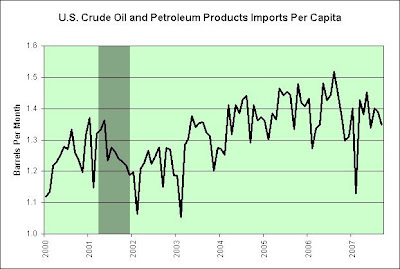 It isn't easy to get Americans to slow our consumption of oil, but it is possible apparently. I don't know about you, but I'm certainly driving less. The people at VERSUS have updated their upbeat song for the holidays. The following charts are all created from Table B.100 in the Flow of Funds Accounts of the United States. I have divided all data in the following charts by personal disposable income (to give some idea what our ability to pay for things would be). 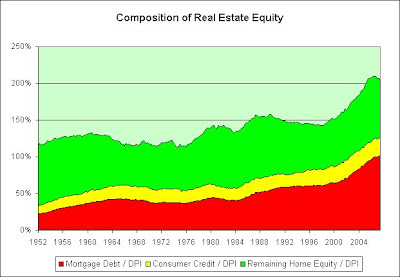 This chart shows the tangible real estate household assets. Be warned that I've set the left scale's starting point at 100% (vs. 0%) so that more detail can be seen. 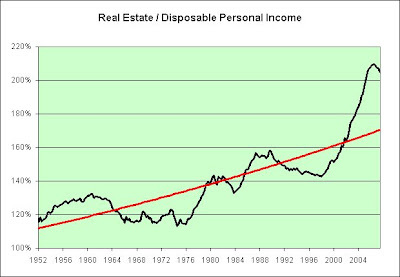 In order to get the black line back down to the long-term exponential trend line either real estate asset prices must come down (presumably through deflation) and/or personal disposable incomes must go up (presumably through inflation). Heaven help us all if they both come down (recession?). That wouldn't necessarily help improve this picture much, unless real estate prices came down much faster than disposable incomes. 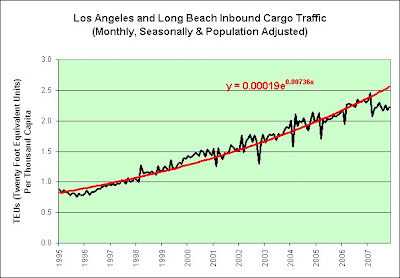 Further, there is no guarantee that the exponential growth is even sustainable. Japan found that out the hard way when their population stopped growing. Please note the change in behavior in the chart once we fell off the gold standard in the early 1970s. This stacked chart shows where the value of our homes lie. As a current homeowner, I'm of the belief that structures are depreciating assets. They should therefore not keep up with inflation unless you are willing to continually pump money into them (repaint the house, replace the carpets, roof, windows, and so on). It would make sense that the land itself is continually worth more though, assuming the population continues to grow. 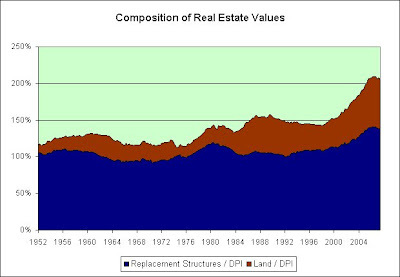 The thing that most strikes me about the chart is that as the land became more expensive, we opted to put more expensive houses on it. In other words, we somehow rationalized that we could have our cake and eat it too. It is the same thing we heckle our government about. When given the choice between more expensive land and more expensive structures, we opted for both! It doesn't stop there though. If you've got a nice chunk of land and a nice house on top of it, might just as well park a few nice cars in the driveway, right? In relation to the price of homes these days, luxury cars are cheap apparently. How did we pull that little trick off? Inquiring minds want to know! The best way to look at this stacked chart might be to start at the bottom. 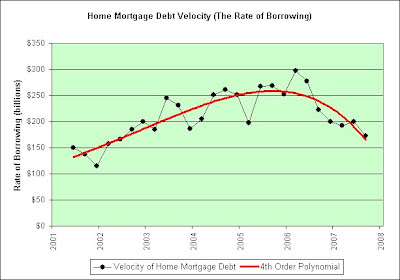 First is the mortgage debt. That alone should make people cringe. I've added on consumer credit (which may or may not be appropriate depending on how you want to look at it). The remaining amount I'm calling the equity in the house. As can be seen in the chart, we have really embraced debt. Here's something else that should make people cringe. 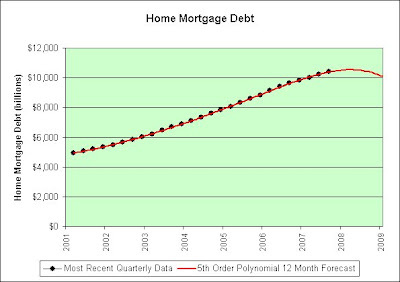 Not all homeowners have embraced debt. There's a good chunk of the population that has their house paid off. That means the potential pain seen above is potentially concentrated. Here's another thing that should make people cringe. Median incomes have not kept up with inflation during this housing boom. The richest among us are pulling up the averages. Can the median homeowner really afford the median home? I'm thinking the answer could turn out to be no. If so, that will pose great problems for Bernanke's magical prosperity printing press. Inflation isn't going to solve a problem of affordability. In my opinion, inflation makes it worse. Picture what's going to happen to that chart if home prices drop 15%. The word ugly does not do it justice. Much of the damage would be immediately inflicted on the green section. The yellow and red sections could also take damage though, especially if the bankruptcy word becomes popular once again. Normally I'd look at these charts and want to scream deflation at the top of my lungs. I guess we'll see just how much yellow and red pain Bernanke and our government are willing to allow. Bankruptcy is not the only "b" word that comes to mind. Bailout and banks do as well. You will note that I was a good American in these charts. I didn't attempt to work in our rising national debt. Let's just continue to ignore that problem since we're not really sent a bill for that directly. It just shows up in the price of oil sometimes and may bleed over into food. Who knows! Housing debt continues to climb ($5 trillion in just six years). I wonder if we can continue to double it every six years? It doesn't seem likely. We were on a trillion dollar a year pace, but something seems to be slowing our rate of climb recently. Perhaps gravity is bringing us back down to the cold hard reality of earth. The trend lines in the charts represent one very dire outcome out of many. I'm not attempting to predict the future, but merely offer a warning.